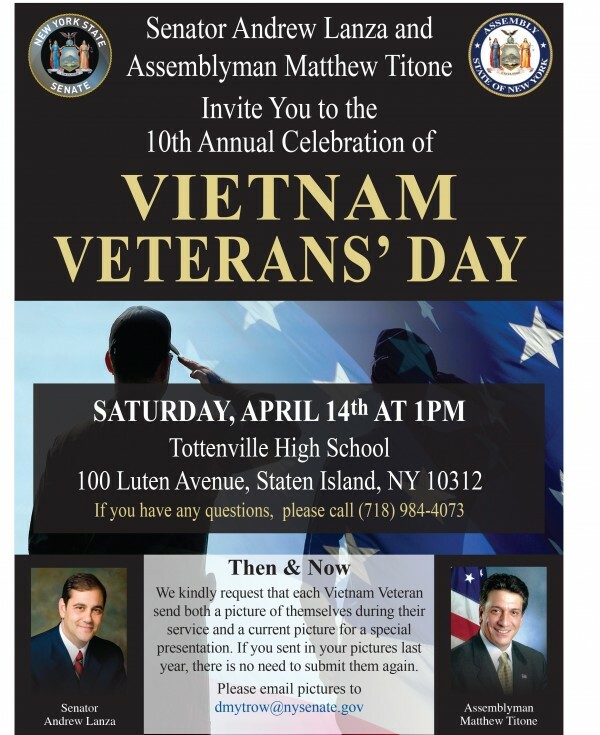 Senator Andrew Lanza and Assemblyman Matthew Titone invite you to join us at Tottenville High School on Saturday, April 14th at 1pm to recognize the sacrifices of those who served in the Vietnam War at our 10th Annual Vietnam Veterans’ Day Ceremony. In 2008, Senator Lanza and Assemblyman Titone authored a law designating March 29th as Vietnam Veterans’ Day in the State of New York. On March 29, 1973, the last 2,500 troops were withdrawn from South Vietnam, thus ending military involvement in one of the longest wars in our Nation’s history. Due to the unpopularity of this war, the men and women who survived and the 58,195 brave souls who fought and died, were never given the proper respect and gratitude they deserved for serving their country. Of the names listed on the Vietnam Memorial Wall, 4,120 are from the Great State of New York. Every year, Senator Lanza and Assemblyman Titone host their annual celebration of Vietnam Veteran’s Day to properly thank our veterans who fought bravely in Vietnam. We are asking that Vietnam Veterans who have not previously submitted “Then and Now” photos of their time in service and from present day to submit photos to dmytrow@nysenate.gov for a special video presentation.